Pattaya workers painting new lines on city roads left some more-creative designs on Third Road when the reflective coating was spilled and left near the Phettrakul Road intersection. 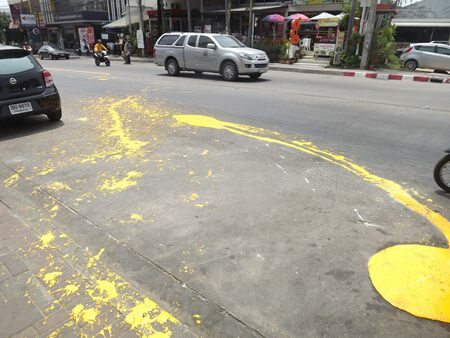 The blotches and streaks of yellow reflective paint match that used to paint area roads. It appears workers spilled paint and did not clean it up. 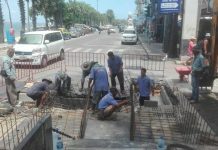 Local motorbike taxi driver Theerawat Bunyakrathok, 40, said it was road workers who recently were in the area who were responsible. While the lines cannot be mistaken for lane markings, they look messy and disorderly and should be removed by city hall, he said. Next articleWhere is the logic?